Welcome to our School's Blog Spot, please ALSO visit the class links BELOW to see what's going on around the school. We hope you will find it interesting and informative. The John Bramston Signing Choir have recorded their performance for our entry into the Strictly Come Signing competition! Our video will be sent to the judges who will decide if we make it through to the next round of the competition and perform at Hawkey Hall. Our signing superstars have worked tirelessly to master such a complicated performance involving signing, signing, choreography and confidence and we are so very proud of them. Take a look at our performance below. What a great day we had today! Not only did the students get a well deserved break for the Easter holidays, just before they finished up we had the honour of welcoming our local MP, Mr. Wes Streeting, into our school. Mr. Streeting addressed a special assembly to help the children understand his role in government and to take questions from the children. The John Bramston students did themselves proud today with some interesting and insightful questions and Mr. Streeting gave us an understanding of politics from the inside. On top of all that, our Article 12 Ambassadors were able to support Unicef's OutRight 2018/2019 campaign for cleaner air by presenting a letter from the John Bramston students, signed by the Article 12 Ambassadors, asking for Mr Streeting to bring the campaign to the attention of the Secretary of State for the Environment, Mr. Michael Gove MP. Thank you very much to Mr. Streeting for spending some of his valuable time with us here at John Bramston Primary today. Over the past few weeks, the Article 12 Ambassadors at John Bramston have been working with Redbridge Council to develop their Making Redbridge More Child-Friendly initiative. The council have been looking for meaningful ways to engage children in the initiative and to encourage the sharing of children's ideas and opinions. 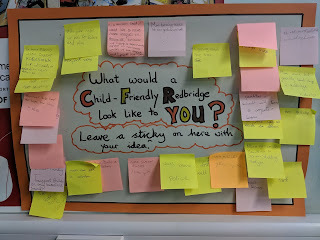 They asked the children of John Bramston to help test their questionnaire before it is sent out to all Redbridge schools. Was it easily understood by our students? What changes to the wording could lead to a greater understanding? Once this was completed, the ambassadors read the updated questions to their classes and took suggestions. "It was really valuable and has given me a clearer picture of how we want to engage with other schools going forward." Well done to everyone involved, those who took an active part in discussions as well as those who contributed to our post-it poster suggesting improvements to the borough. Article 12 in action! On Thursday 7th March, pupils and teachers at John Bramston celebrated World Book Day. Everyone really enjoyed dressing up as their favourite book characters! Each year group, from Reception up to Year 6, took part in a Wow Word Walk through school hunting for new and exciting vocabulary. Every class enjoyed discovering new Wow Words and learning their meanings. All of the classes took part in a Reading Robin at the end of the school day where each class shared a story with a different class teacher. Pupils were very excited to find out which teacher would be paying them a visit to 'share a story'! Pupils were given a £1 book token to spend - how will you spend yours? Today some of Year 5 and 6 children went to Forest Academy for STEM (Science Technology Engineering and Maths). They worked as a team in small groups with a year 13 from Forest Academy. They loved working as a team to make the tallest tower. This week it got very competitive! 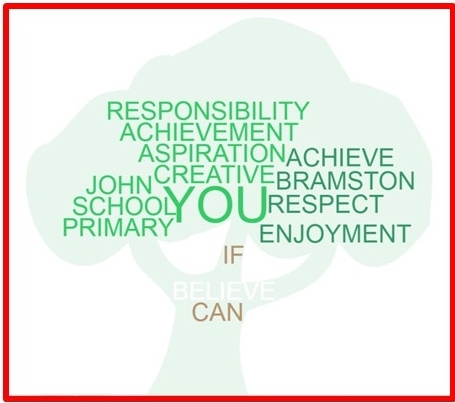 On Thursday 31st January selected children from Year 3 and 4 went to Forest Academy. They enjoyed a STEM (Science. Technology, Engineering and Maths) workshop where they had to work as a team to build the tallest tower. The workshop was run by Mr Gregory. Can you tell which tower was the tallest?